Physical activity, which has been defined as “any bodily movement produced by skeletal muscles that results in energy expenditure” , provides important health benefits across the lifespan. However, a large percentage of Americans fail to meet current physical activity guidelines, and this deficiency accounts for a sizeable population health burden. A core function of public health, “surveillance” refers to “ongoing, systematic collection, analysis, and interpretation of outcome-specific data for use in the planning, implementation, and evaluation of public health practice” [2,3]. There are many different forms of physical activity, and physical activity is performed at varying intensities, in numerous settings, and for multiple reasons. Physical activity behavior is known to be influenced by personal, social, physical, environmental, institutional, community, and societal factors. 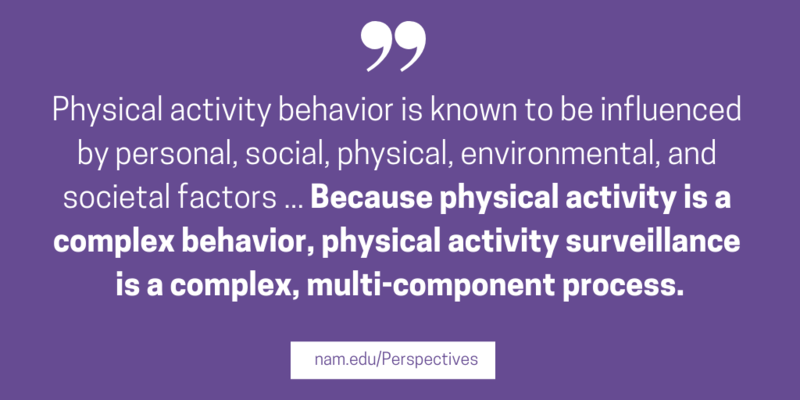 Because physical activity is a complex behavior, physical activity surveillance is a complex, multicomponent process. In the U.S., the existing system for surveillance of physical activity includes some important resources, but it also includes many gaps, catalyzing the need to develop a more robust physical activity surveillance system in the United States—a priority identified in the 2016 National Physical Activity Plan . The Physical Activity and Health Innovation Collaborative (PA IC) is an ad hoc activity affiliated with the Roundtable on Obesity Solutions at the National Academies of Sciences, Engineering, and Medicine. The PA IC brings together individuals from various disciplines and sectors—such as academia, government, nonprofit organizations, foundations, health care, and the private sector—to discuss strategies to promote active lifestyles among Americans. Consistent with this goal, the PA IC convened a panel of experts in April, 2017 to catalyze development of a more robust physical activity surveillance system in the U.S. Representatives from key organizations—including the American College of Sports Medicine, American Heart Association (AHA), Centers for Disease Control and Prevention (CDC), National Institutes of Health, and National Physical Activity Plan Alliance—formed a planning group and organized the meeting, which brought together 42 experts April 25-26, 2017, in Washington, DC. The purpose of the meeting was to identify specific actions that could improve physical activity surveillance in the United States and to suggest approaches for moving forward on those actions. The experts attending the meeting represented four priority areas: 1) children and youth, 2) health care, 3) workplaces, and 4) community supports for active transportation. The experts used the 2014 meeting’s overarching strategies and priorities identified to guide the future of physical activity surveillance as a framework for the initial planning . Prior to the in-person meeting, participants engaged in advance work to decide on organizational schemes to guide the in-person discussions and identify current and existing surveillance systems related to relevant policies and programs for each priority area. On the first day of the meeting, the subgroups met to identify critical gaps and opportunities for action to fill those gaps. In a full group session, the experts separated into subgroups focused on each priority area to share and discuss critical gaps and opportunities within each priority area. The full group also identified issues that cut across the priority areas. During the second day, the subgroups identified specific recommended actions within the four priority areas to improve physical activity surveillance in the United States, focusing on those actions that could be undertaken within one to three years. The critical gaps and specific actions identified for the four priority areas are described in the sections below. Expert panelists, working in sub-groups for each of these four areas, identified critical gaps and specified high priority actions for improving surveillance of physical activity. A total of 23 recommended actions were selected to advance surveillance of physical activity in specified population sub-groups and to enhance monitoring of institutional and community supports that influence physical activity behavior. The health effects of physical activity in children and youth are well documented. These include more favorable cardiometabolic risk factors, better weight status and body composition, and enhanced cardiorespiratory and muscular fitness. In addition, higher levels of physical fitness are associated with multiple positive indicators of health in youth, and both physical activity and physical fitness are positively associated with academic achievement in children and youth [5,6]. Further, there is growing concern that high levels of sedentary behavior may be associated with negative health outcomes in young people. Because physical activity and physical fitness are linked to children’s health status, efforts to monitor these characteristics in US youth have a long history. Physical fitness was routinely assessed in representative samples of children and youth between the 1950s and the 1980s, and it was assessed in the National Health and Nutrition Examination Survey (NHANES) National Youth Fitness Survey in 2012 . Monitoring of self-reported physical activity in high-school students has occurred regularly since 1991 through the Youth Risk Behavior Survey (YRBS) , and accelerometer-measured physical activity was assessed in representative samples of US children and youth in the 2012 NHANES National Youth Fitness Survey. In addition, selected sedentary behaviors have been assessed in YRBS and the NHANES surveys . The status of school physical education and other school-based physical activity policies and programs was assessed regularly at the national level from 1994 to 2016 through the School Health Policies and Practices Study . School Health Profiles (Profiles), an ongoing system of surveys, assesses school health policies and practices in states, large urban school districts, and territories . Profiles monitors the status of school-based physical education, classroom physical activity breaks, intramural sports, interscholastic sports, and access to physical activity facilities. As noted above, the physical activity surveillance system in the United States has included some important resources for assessing physical activity in children and youth. However, the system is also lacking in some areas. The subgroup on surveillance of physical activity in children and youth identified two critical gaps. First, existing physical activity surveillance systems provide ongoing monitoring of physical activity levels only for self-reported physical activity in high school students. Because YRBS reports on students in grades 9-12, large gaps exist in our knowledge of physical activity behavior in younger children (ages 2-14). Of note, while limited as an overall measure of physical activity, data on self-reported physical activity is essential for other purposes, such as social context, physical context, and specific forms of physical activity. In addition, despite important advances in wearable devices that measure physical activity, current physical activity surveillance systems are not regularly using the data produced by these devices. Existing systems are limited in the extent to which they monitor children’s participation in specific forms of physical activity or their engagement in specific types of physical activity programs (e.g., community-based youth sports programs, school-sponsored sports, dance lessons). Second, physical activity in children and youth is influenced by a wide variety of factors, including environmental factors and institutional policies and practices. However, comprehensive national surveillance of those environmental factors and policies and practices is currently not performed. No surveillance system monitors physical activity policies and practices in child-focused settings other than schools, including child care centers and community-based organizations. Incorporate into future cycles of NHANES physical activity and sedentary behavior measured by wearable devices, and measures of physical fitness in children and youth ages 2-18. Modify or expand the existing YRBS to provide state-of-the-art information on participation in specific forms of physical activity and sedentary behavior, and expand the middle school YRBS to be representative of the United States. Monitor participation of children and youth ages 2-18 in specific forms of physical activity and monitor their sedentary behavior (e.g., television watching, studying) by incorporating state-of-the-art self-reporting instruments into existing programs and surveillance systems. Some examples of systems that could be modified to address this include NHANES, YRBS, National Health Interview Survey (NHIS) , and National Survey of Children’s Health . Monitor prevalence of physical activity assessment, counseling, and referral of children by health care providers to community-based providers of physical activity services to youth (also see the “Health Care Settings” section). Potentially relevant systems include National Ambulatory Medical Care Survey , Medical Expenditure Panel Survey , NHIS, and the Healthcare Effectiveness Data and Information Set (HEDIS) . Enhance surveillance systems that monitor school-based physical activity policies and programs, such as the School Health Profiles. For example, additional information consistent with the Comprehensive School Physical Activity Program model  could be collected. Develop a protocol that leverages ongoing school-based administration of physical fitness tests, such as FitnessGram , to monitor fitness levels of children and youth in the US population. Explore development of a physical activity surveillance protocol that would leverage device-based (e.g., fitness trackers, smart watches) or self-reported indicators of physical activity provided by convenience samples of children and youth. Develop and implement a system for monitoring physical activity policies and practices in child care centers and preschools. Develop and implement a system for monitoring community-level availability of sports and other physical activity programs for children and youth. Identify elements of the built environment that influence physical activity in children and youth, and embed assessment of the perceived availability and utilization of those resources in existing surveillance systems. Relevant systems include NHANES, YRBS, NHIS, and National Survey of Children’s Health. Strong scientific evidence demonstrates that physical activity both reduces the risk of many chronic medical conditions and provides effective treatment for many diseases. Hence, strong consensus exists that health care providers and health care systems should promote physical activity to patients. For example, Healthy People 2020 includes objective PA-11: “Increase the proportion of physician office visits that include counseling or education related to physical activity” . The National Committee for Quality Assurance’s (NCQA’s) HEDIS includes quality-of-care measures for assessing physical activity in children and older adults and counseling on such activity . Monitoring in the health care setting involves two activities: 1) assessing a patient’s current level of physical activity and 2) providing advice and/or education about physical activity. The vast majority of health care providers now use electronic health records (EHRs) to document the assessments and services they provide. Thus, assessments of physical activity levels and documentation of advice are included in the EHR with increasing frequency. While EHR data on physical activity are not yet part of national surveillance systems, major precedents exist for using EHR data in surveillance. Data on notifiable diseases collected in health care settings already contribute to national surveillance as part of the National Notifiable Diseases Surveillance System . In addition, the CDC has demonstrated the feasibility of extracting and sharing EHR data for surveillance via its Biosense Platform—an integrated surveillance system for the rapid assessment of bioterrorism-related events . It is appropriate, then, to identify possible ways in which health care data systems can contribute to national surveillance of physical activity in US children and adults. This effort will require identifying gaps in current surveillance data and ways to improve data collection. Whereas other national physical activity data sources provide cross-sectional data, notably, EHRs can provide longitudinal data. Further, using EHR data is efficient, as it provides useful information at three levels: personal (for patient care), local (for population management of diseases and risk factors by health care systems), and national (for surveillance). The subgroup on surveillance of physical activity in health care settings identified four important gaps in existing surveillance systems in this area. First, current surveillance systems have limited specificity and capacity to characterize physical activity levels in population subgroups of interest, including people with specific diagnoses, specific high-risk groups, and rising-risk groups (such as those with an increasing risk of fall injuries). EHR data could potentially address this limitation. However, data on physical activity levels of patients are not yet widely documented in EHRs, and initiatives proposing that physical activity be added as a “vital sign” in the EHR have not yet achieved widespread success. Second, there is no standardized and widely used quality-of-care measure for monitoring the quality of counseling on and promotion of physical activity in adults in health care settings (although, as noted above, NCQA HEDIS measures do exist for children and older adults). Third, health care providers do not typically collect data on cardiorespiratory fitness and muscle strength, despite the importance of fitness to health and mortality risk and the fact that feasible clinical measurements exist (e.g., grip strength as a screening test for sarcopenia in older adults). The fourth gap is commented on in other sections of this report: current surveillance systems are not measuring physical activity with wearable devices on a large-scale, ongoing basis. Wearable device technology for measuring physical activity is becoming inexpensive and relatively accurate, and many consumers use it widely. Part of the gap in the use of wearable device data is due to the underdevelopment of information technology for 1) storing and retrieving health care system data, 2) analyzing and interpreting data, and 3) harmonizing data from multiple sources to the national level is not yet well-developed. For example, most health care systems currently cannot evaluate their efforts to promote physical activity over time, cannot assess prevention of chronic diseases, and cannot calculate return on investment. Health care system assessments of physical activity and the metrics used to score those assessments are not standardized, which complicates data aggregation. An opportunity exists to explore the feasibility of including data from wearable devices in health care system data by launching pilot projects that measure physical activity in high-priority subgroups, where the return on investment is potentially high. There is a longer-term opportunity in the use of device-assisted measures of gait and balance, given that gait and balance are strong predictors of health and mortality risk as people age. For example, the Timed Up and Go (TUG) performance test is useful in assessing risk of falls. Recent studies suggest data from an accelerometer, worn during the TUG test, have the potential to improve the ability of this performance test to measure physical function and estimate risk of falls [22,23]. Expand the use of physical activity “vital sign” and “counseling” indicators in health care systems conducting population health management. Methods to measure these indicators already exist, and a demonstration project could leverage existing networks and data-sharing agreements to demonstrate the feasibility of using EHR data for surveillance. Consider how national health surveys that include questions dealing with physical activity could address both measures of physical activity levels and counseling for physical activity. Currently, some surveys with physical activity content—such as the National Ambulatory Medical Care Survey—do not measure both physical activity levels and counseling. Design and implement pilot and demonstration projects on the validity and feasibility of routine measurement of grip strength (or grip power) among older people. These measures could be piloted or added to “Welcome to Medicare” visits to systematically monitor muscle strength in older adults. Design and implement pilot and demonstration projects that assess the use of low-cost, clinic-based, or self-administered walking tests as indicators of cardiorespiratory fitness for older adults. For example, the 400 meter walk test can provide a valid estimate of aerobic capacity (peak VO2) in older adults . Potentially, data from a wearable device worn during the walk test could improve the test’s ability to estimate aerobic fitness. Priority groups for these projects include people at risk or rising risk for cardiovascular disease and/or type 2 diabetes. 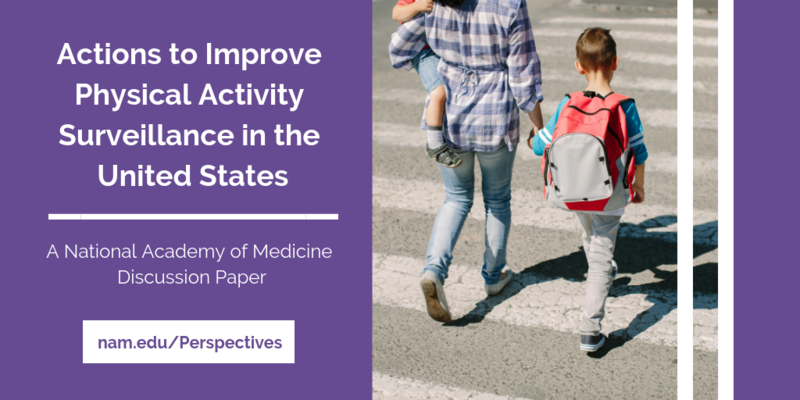 Consider how, or if, age-appropriate, self-reported measures of physical activity could be incorporated into existing routine Medicaid assessment questionnaires that deal with preventive health behaviors in children and adults. For example, the Staying Healthy Assessment Questionnaire  used in California includes questions on physical activity. Expanding surveillance in less advantaged populations helps track the effects of public health initiatives to reduce health disparities. After identifying existing projects and/or implementing new projects, conduct use cases involving monitoring of patients with wearable devices. In these projects, select patient target populations based on factors such as morbidity status, utilization, cost, and potential for return on investments in monitoring (e.g., device costs and data analysis costs). Although it will take time to scale up surveillance with wearable devices, it is important to “break the ice” with projects that provide a learning laboratory for the use of wearable devices in physical activity surveillance. Envision a public-private partnership with resources from multiple sources that 1) build capacity to launch and evaluate initiatives to promote physical activity in patient groups, 2) use EHR data to monitor and manage adverse events due to physical activity, and 3) monitor physical activity levels among priority patient subgroups (e.g., physical activity levels in people with prediabetes as an indicator of effectiveness in preventing type 2 diabetes). Offer health care systems incentives to use similar data analysis methods and share data to create national-level estimates of physical activity indicators. Employed adults in the United States spend a majority of their time at work each day. Accordingly, the workplace setting provides an important opportunity to improve physical activity surveillance of adults across the population. Increasingly, employers are integrating physical activity and physical fitness assessment into incentive design and programming. They are also using, and even purchasing, mobile health technologies for more accurate assessment. Surveillance opportunities in the workplace can capture physical activity levels for a significant part of the day and help to evaluate workplace culture, program design, and policies that promote physical activity and active transportation to and from work. Vendors and health plans are collecting aggregate data from employers across a wide range of industry sectors, employer sizes, job locations, occupations, and types of employees. Some current surveillance systems capture information on workplace physical activity (e.g., the Occupational Requirements Survey , NHANES) and workplace supports for physical activity and physical fitness assessment (e.g., Workplace Health in America ). Data systems that may be modified for surveillance include Fitwel  and other similar efforts that assess workplace building design and operations; numerous organizational health scorecards [29,30,31] that evaluate the degree to which workplace policies, programs, and environmental supports improve employee health and well-being; health risk assessments and biometric screening; and tracking device data repositories managed by health promotion vendors and suppliers. Despite a substantial amount of existing data, current surveillance and data collection systems do not capture several key factors. In addition, connecting data from existing systems may provide a broader picture of how the workplace (and transportation to and from work) contributes to overall physical activity and physical fitness across the US population and to identifying disparities. The subgroup on surveillance of physical activity in the workplace identified several important gaps relevant to the adequacy of surveillance in this sector. Currently, primary constructs for physical activity, physical fitness, and sedentary time are not standardized or integrated across workplace surveillance systems. Additionally, the metrics used to measure physical activity and physical fitness in health risk assessments are not standardized across workplaces and employers. It is important to have the ability to analyze consistent, aggregated data to correlate physical activity and physical fitness with employer size, industry type, health equity attributes, and other demographic variables. Ideally, public and private sources could share data to foster surveillance opportunities on physical activity and physical fitness in the workplace. Employee-level data can be aggregated, de-identified, and linked to national surveillance or clinical-level databases with appropriate consumer protections. Data privacy issues are paramount with individual-level information. Optimally, personalized health information about physical activity and physical fitness, captured in a health risk assessment or biometric screening, can be linked to the employee’s EHR to create linkages to the health care system. The first step is to develop, disseminate, and adopt common metrics for best practice measurement of individual-level physical activity, physical fitness, and sedentary behavior that could be used consistently in data collection efforts through health risk assessments, biometric screening, and/or wearable devices. It will be important that these best practice workplace physical activity and physical fitness metrics are congruent with the Americans with Disabilities Act, Occupational Safety and Health Administration regulations, and state or other regulations that address physical requirements in the workplace. It is also important to have clear and consistent metrics to evaluate workplace culture, building design, leadership role modeling, and employer support for physical activity and physical fitness. With this information, business leaders, architects, vendors, program designers and human resources personnel will be able to understand the main facilitators of and barriers to successful physical activity– and physical fitness–promoting policies and programs. Current resources do not exist to support comprehensive, longitudinal surveillance efforts, which would coordinate existing systems and fill gaps in datasets. Develop and identify consistent measures for workplace designs and operations, policies, programs, and culture, and employee perception of support for physical activity that could be included in comprehensive surveillance of physical activity and physical fitness in the workplace. Ensure these measures are consistent with the second edition of the Physical Activity Guidelines for Americans . Publish, promote, and disseminate the measures for implementation. Key implementers could include the AHA, Health Enhancement Research Organization (HERO), CDC, NCQA HEDIS, Health Care Systems Research Network (HCSRN) , and health promotion vendors and suppliers. Promote longitudinal data collection and conduct additional research. Explore the feasibility of establishing a repository for workplace data that is publicly available and accessible for research and surveillance purposes. Key exemplars to inform and participate in this effort would be the Employer Measures of Productivity, Absence and Quality , National Quality Forum , HCSRN, and Integrated Benefits Institute . Investigate the opportunity to include organizational health scorecards (e.g., Fitwel, HERO, AHA, CDC) in workplace surveillance. Community supports for physical activity can help to adjust behavior, including the increased use of active forms of transportation. These supports can take numerous forms, including built environment design, policies, social environments, and programs. Active transportation is any human-powered means of travel, such as walking, biking, or wheelchair rolling. Public transport is also a form of active transportation, because it involves walking at the beginning and end of most trips. Community design can support active transportation in various ways, including by locating residences within short walking distance of stores, workplaces, public transportation, and schools. Street design can enhance pedestrian and bicyclist safety by providing sidewalks or paths between destinations that are well connected, safe, and attractive; improving street crossings; and reducing traffic speed. Communities can plan, design, construct, retrofit, and maintain streets and public spaces in ways that make physical activity easier to incorporate into daily life. Zoning codes and policies, such as form-based codes and Complete Streets policies, can act as levers to encourage and support these active design changes. 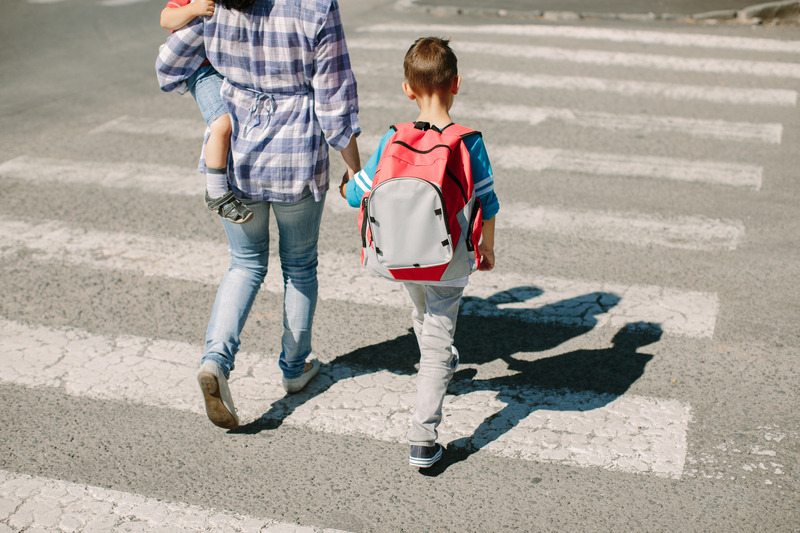 Programs such as Safe Routes to School and other initiatives can promote active transportation by increasing awareness of opportunities, changing attitudes, and creating incentives for walking and bicycling. Several recent efforts—such as Step It Up! The Surgeon General’s Call to Action to Promote Walking and Walkable Communities  and the Community Preventive Services Task Force  recommendation for combined built environment approaches to increase physical activity—have called for promoting community supports for active transportation. Though the evidence for these environmental, policy, and program strategies is widely accepted in public health, much work is needed to improve the surveillance of these initiatives. The goal of improved surveillance is to provide evidence of progress and guide further efforts to enhance the quality, reach, and equity of community supports for active transportation. 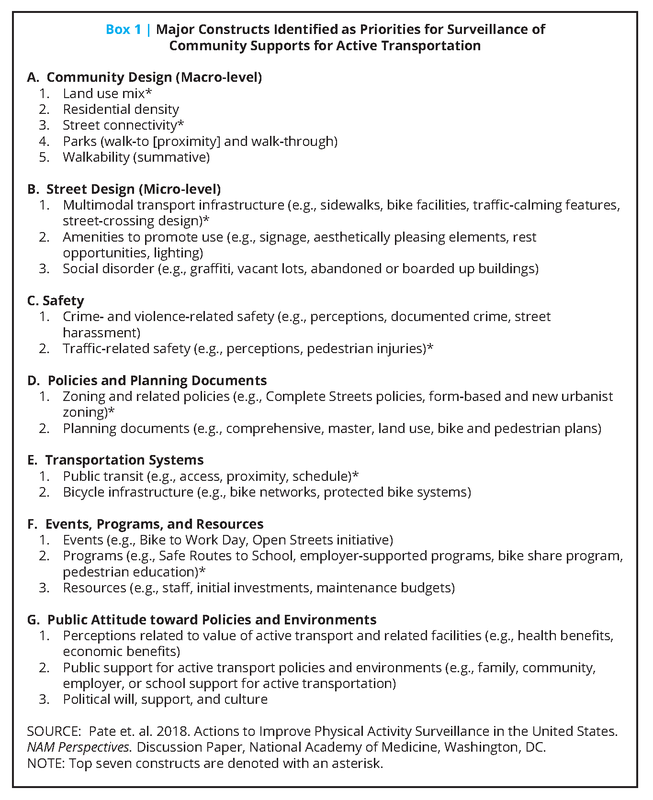 An initial step of the group of experts that authored this paper was to identify and prioritize constructs for the surveillance of community supports for active transportation. The workgroup created an initial list of 20 major constructs and identified seven constructs as the highest priorities to consider for surveillance actions (see Box 1). Priority status was based on the level of evidence that the construct relates to higher physical activity, its relevance to active transportation, and the potential for change over time. In addition, the group considered the potential overlap between constructs and the breadth of constructs covered. No surveillance system routinely and comprehensively monitors individual perceptions of community supports for active transportation at the national, state, and local levels. National surveys, such as the NHIS, have asked individuals about the presence of a support or barrier at one point in time. Several validated self-reporting questionnaires that assess individual perceptions of community supports exist, and these could be incorporated into existing survey-based surveillance systems. However, the length of these questionnaires can be a barrier to use. Public datasets from national surveillance systems lack geospatial information, which limits their use for examining estimates below the state level and for linking survey data with other data sources, such as policy or geographic information system (GIS) data tied to specific geographic areas (e.g., municipal jurisdiction or census block group). In some cases, restricted datasets available at a research data center allow access to geospatial information that can facilitate linking data; however, in most cases, local-level estimates are not possible given small sample sizes. Local data are particularly important because land-use and many transport decisions are made at the local level, and the presence of community supports varies widely within and between communities. Centralized, consistent, and easy-to-use GIS datasets that offer information on a comprehensive set of community support measures are lacking. Some relevant measures of community supports are available as part of spatial data within existing national GIS datasets (e.g., the Environmental Protection Agency [EPA] Smart Location Database , Fatality Analysis Reporting System [FARS] , Esri Business Analyst ). However, these data are often complicated to use, especially for local practitioners who may not have the resources to conduct spatial analysis. Quality, completeness, and date of collection are often unknown for GIS data. GIS measures can vary in the scale at which they provide data, which may not match the user’s level of interest (e.g., individual residences, at the census block group). The underlying data and schema used for collection and derivation of measures are not standardized across jurisdictions. This can make it unclear how or if data from different sources are comparable. Finally, GIS measures are not centrally stored, making it challenging to find and combine measures into a common scale or unit. Methods for active transportation–related policy surveillance are complex. All levels of government adopt active transportation–related policies to some degree, but these policies are most often sustainably deployed at the county and municipal levels. Examples of active transportation–related zoning and policies include form-based and new urbanist zoning codes, which, by design, are pedestrian-oriented; Complete Streets policies; and Safe Routes to School policies. Collecting and abstracting information about such policies can be resource intensive. Compiling such policies nationally is feasible, because most jurisdictions have this information posted digitally; however, such policy collection may take substantial time and effort, depending on the scope of the surveillance and what information is included in the system. Abstraction and evaluation of the content of these policies for inclusion in a surveillance system are more resource intensive activities than simply collecting the policies. There is a need to find the right balance between simplicity and abstraction for surveillance of active transportation–related policies. Feasible methods to incorporate alternative approaches for assessing community supports for active transportation into surveillance are lacking. Audit (systematic observation) tools for assessing community supports for active transportation are available. However, these assessments are also resource intensive, and tools differ in scale (e.g., whole neighborhood versus street segment) and breadth of information collected. In the medium term, audit data could be collected by working with organizations that could use a citizen science approach to collect data. If national organizations could engage local affiliates, it may be possible to accumulate a nationwide database of audits. A longer-term approach would include conducting audits remotely by abstracting information from available aerial photos or images (e.g., Google Street View) using computer-based algorithms. However, wide-scale remote audits would require developing a valid method to automate abstraction of the relevant constructs from the images and would require documenting the reliability and validity of using photos or images for the measure. An alternative would be to have community members (i.e., citizen science) collect data on the presence and quality of community supports. Reliability and comparability of these data across auditors would need to be established, and using tools such as Open Street Map may help improve data quality and consistency. Surveillance data related to programmatic and social environment constructs are not routinely collected. There is some data collection of programmatic supports in schools (e.g., Safe Routes to School) and employer-sponsored programs (e.g., incentives to promote participation). To develop questionnaires for assessing the presence of programmatic and environmental supports across a variety of settings, the first step is to identify key measures to capture these constructs. Using information related to local-, state-, and national-level programmatic funding and budgeting may be a viable method for collecting information on resources provided to programmatic and social environment supports. The challenges in collecting such information include the lack of consistency in compiling and reporting this information as well as the lack of identified groups and resources to support data collection. Create a brief set of prioritized constructs and corresponding survey items to assess perceptions of community supports for active transportation. Assess their inclusion on national surveillance systems (e.g., NHIS, NHANES, Behavioral Risk Factor Surveillance System , YRBS, National Household Travel Survey  on an appropriately recurring interval) whenever possible. Promote their use with local practitioners to build local and state databases. Develop methods to link data from surveillance systems with policy, systems, and environmental data using smaller geographic units (e.g., municipal jurisdiction or census block group) while protecting privacy. Identify, compile, and make available GIS sources of community supports for active transportation support constructs (e.g., EPA Smart Location Database, FARS, Esri Business Analyst data, National Transit Map data , Reference USA ). Institute a multisector consensus process to develop recommended GIS measures relevant to community supports for active transportation that could be adopted by local, state, and federal agencies. Develop and standardize methods for documenting and collecting geospatial policy, systems, and environmental data. Explore opportunities for partnering with professional organizations(e.g., American Planning Association) to query their membership about the presence of supportive policies in the communities where they work. Consider how to balance the simplicity and scientific rigor of existing active transportation–related policy collection systems, such as those developed by the National Complete Streets Coalition, the Form-Based Codes Institute, and the Vision Zero Network. Identify a brief set of prioritized constructs that could be assessed using audits. Develop and validate computer-based algorithms for automating remote audits using online images. Explore methods for capturing local-level constructs using automated remote sensing or citizen science. 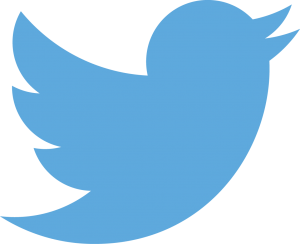 Identify the key measures to capture programmatic and social environment constructs. Create validated survey questions to assess key programmatic and social environment constructs related to active transportation to or from specific settings (e.g., school, workplace, community). Explore the use of alternative data sources (e.g., information on programmatic funding, local record collection) for measuring these key constructs. The group of experts that authored this paper has identified numerous important gaps in the current US physical activity surveillance system. The group recommended 23 actions that, if executed, would produce a much more robust system for monitoring physical activity behavior in the US population and for assessing the status of policies, programs, and elements of physical infrastructure that influence participation in physical activity. Many of the recommended actions call for the enhancement of existing surveillance systems. Some of the recommended actions highlight the value of developing new or modified methodologies, and many of these methodologies would take advantage of emerging technologies for observing human behavior or professional practice. Caspersen, C. J., K. E. Powell, and G. M. Christenson. 1985. Physical activity, exercise, and physical fitness: Definitions and distinctions for health-related research. Public Health Reports 100(2):126-131. Thacker, S. B., and R. L. Berkelman. 1988. Public health surveillance in the United States. Epidemiology Reviews 10:164-190. Fulton, J. E., S. A. Carlson, B. E. Ainsworth, D. Berrigan, C. Carlson, J. M. Dorn, G. W. Health, H. W. Kohl III, I. M. Lee, S. M. Lee, L. C. Masse, J. R. Morrow Jr., K. P. Gabriel, J. M. Pivarnik, N. P. Pronk, A. B. Rodgers, B. E. Saelens, J. F. Sallis, R. P. Troiano, C. Tudor-Locke, and A. Wendel. 2016. Strategic priorities for physical activity surveillance in the United States. Medicine and Science in Sports and Exercise 48(10):2057-2069. National Physical Activity Plan Alliance. United States report card on physical activity for children and youth. Columbia, SC. Physical Activity Guidelines Advisory Committee. 2018. 2018 Physical Activity Guidelines Advisory Committee scientific report. Washington, DC: US Department of Health and Human Services. Institute of Medicine. 2013. Educating the student body: Taking physical activity and physical education to school. Washington, DC: The National Academies Press. Centers for Disease Control and Prevention (CDC), National Center for Health Statistics (NCHS). 2012. National Health and Nutrition Examination Survey (NHANES) National Youth Fitness Survey. https://wwwn.cdc.gov/nchs/nhanes/search/nnyfs12.aspx (accessed March 8, 2018). Youth Risk Behavior Surveillance System. https://www.cdc.gov/healthyyouth/data/yrbs/index.htm (accessed March 8, 2018). CDC, NCHS. NHANES. https://www.cdc.gov/nchs/nhanes/index.htm (accessed March 8, 2018). School Health Policies and Practices Survey. https://www.cdc.gov/healthyyouth/data/shpps/index.htm (accessed March 8, 2018). School Health Profiles. https://www.cdc.gov/healthyyouth/data/profiles/index.htm (accessed June 13, 2018). CDC, NCHS. National Health Interview Survey. https://www.cdc.gov/nchs/nhis/index.htm (accessed March 8, 2018). Data Resource Center for Child and Adolescent Health. National Survey of Children’s Health. http://www.childhealthdata.org/learn/NSCH (accessed March 8, 2018). CDC, NCHS. Ambulatory Health Care Data. https://www.cdc.gov/nchs/ahcd/index.htm (accessed March 8, 2018). Agency for Healthcare Research and Quality. Medical Expenditure Panel Survey. https://meps.ahrq.gov/mepsweb (accessed March 8, 2018). National Committee for Quality Assurance. HEDIS and Performance Measurement. http://www.ncqa.org/hedis-quality-measurement (accessed March 8, 2018). Comprehensive School Physical Activity Program (CSPAP). https://www.cdc.gov/healthyschools/physicalactivity/cspap.htm (accessed March 8, 2018). The Cooper Institute. About FitnessGram. http://www.cooperinstitute.org/fitnessgram (accessed March 8, 2018). CDC, Office of Disease Prevention and Health Promotion. Healthy People. https://www.healthypeople.gov (accessed March 8, 2018). National Notifiable Diseases Surveillance System. https://wwwn.cdc.gov/nndss (accessed March 8, 2018). BioSense Platform. https://www.cdc.gov/nssp/biosense/index.html (accessed March 8, 2018). Ponti, M., P. Bet, C. L. Oliveira, and P.C. Castro. 2017. Better than counting seconds: Identifying fallers among healthy elderly using fusion of accelerometer features and dual-task Timed Up and Go. PLoS ONE 12(4):e0175559. Weiss, A., T. Herman, M. Plotnik, M. Brozgol, N. Giladi, and J. M. Hausdorff. 2011. An instrumental Timed Up and Go: The added value of an accelerometer for identifying fall risk in idiopathic fallers. Physiological Measurement 32:2003-2018. Simonsick, E.M., E. Fan, and J. L. Fleg. 2006. Estimating cardiorespiratory fitness in well-functioning older adults: Treadmill validation of the long distance corridor walk. Journal of the American Geriatric Society 54:127-132. California Department of Health Care Services. Staying Healthy Assessment. http://www.dhcs.ca.gov/formsandpubs/forms/pages/stayinghealthy.aspx (accessed March 8, 2018). Bureau of Labor Statistics. Occupational Requirements Survey. https://www.bls.gov/ors (accessed June 1, 2018). Workplace Health Promotion. https://www.cdc.gov/workplacehealthpromotion/data-surveillance/index.html (accessed March 16, 2018). Homepage. https://fitwel.org (accessed March 8, 2018). HERO Scorecard. Homepage. https://hero-health.org/hero-scorecard (accessed March 30, 2018). American Heart Association. Workplace Health. http://www.heart.org/HEARTORG/HealthyLiving/WorkplaceHealth/Workplace-Health-Solutions_UCM_460416_SubHomePage.jsp (accessed March 30, 2018). Worksite Health ScoreCard. https://www.cdc.gov/workplacehealthpromotion/initiatives/healthscorecard/index.html (accessed March 30, 2018). 2018 Physical Activity Guidelines Advisory Committee. 2018 Physical Activity Guidelines Advisory Committee Scientific Report. Washington, DC: U.S. Department of Health and Human Services, 2018. Health Care Systems Research Network. Homepage. http://www.hcsrn.org/en (accessed March 30, 2018). Employer Measures of Productivity, Absence and Quality. Homepage. http://www.empaq.org (accessed March 30, 2018). National Quality Forum. Homepage. https://www.qualityforum.org/Home.aspx (accessed March 30, 2018). Integrated Benefits Institute. Homepage. https://www.ibiweb.org (accessed March 8, 2018). Department of Health and Human Services. Step it up! The Surgeon General’s call to action to promote walking and walkable communities. https://www.surgeongeneral.gov/library/calls/walking-and-walkable-communities/index.html (accessed March 8, 2018). Community Preventive Services Task Force. The community guide. https://www.thecommunityguide.org (accessed March 8, 2018). Environmental Protection Agency. Smart location mapping. https://www.epa.gov/smartgrowth/smart-location-mapping#SLD (accessed March 8, 2018). National Highway Traffic Safety Administration. Fatality Analysis Reporting System (FARS). https://www.nhtsa.gov/research-data/fatality-analysis-reporting-system-fars (accessed March 8, 2018). ArcGIS Business Analyst. http://www.esri.com/software/businessanalyst (accessed March 8, 2018). Behavioral Risk Factor Surveillance System. https://www.cdc.gov/brfss/annual_data/annual_2016.html (accessed March 8, 2018). Federal Highway Administration. National Household Travel Survey. http://nhts.ornl.gov (accessed March 8, 2018). Bureau of Transportation Statistics. National Transit Map. https://www.bts.gov/content/national-transit-map (accessed March 8, 2018). Reference USA. Homepage. http://resource.referenceusa.com (accessed March 8, 2018). Russell R. Pate, PhD, is professor of exercise science and director, Children’s Physical Activity Research Group, Arnold School of Public Health, University of South Carolina. David Berrigan, PhD, MPH, is program director, Health Behaviors Research Branch and Behavioral Research Program, Division of Cancer Control and Population Sciences, National Cancer Institute, National Institutes of Health. David M. Buchner, MD, MPH, is program director, Department of Kinesiology and Community Health, College of Applied Health Sciences, University of Illinois at Urbana-Champaign. Susan A. Carlson, PhD, is lead epidemiologist, Physical Activity and Health Branch; Division of Nutrition, Physical Activity, and Obesity; National Center for Chronic Disease Prevention and Health Promotion; Centers for Disease Control and Prevention. Genevieve Dunton, PhD, MPH, is associate professor of preventive medicine and psychology, University of Southern California. Janet E. Fulton, PhD, is chief, Physical Activity and Health Branch; Division of Nutrition, Physical Activity, and Obesity; National Center for Chronic Disease Prevention and Health Promotion; Centers for Disease Control and Prevention. Eduardo Sanchez, MD, MPH, MS, is chief medical officer for prevention, American Heart Association. Richard P. Troiano, PhD, is program director, Risk Factor Assessment Branch, Epidemiology and Genomics Research Program, Division of Cancer Control and Population Sciences, National Cancer Institute, National Institutes of Health. James Whitehead is executive vice president and CEO, American College of Sports Medicine. Laurie P. Whitsel, PhD, FAHA, is director, Policy Research, American Heart Association. Participants from the April 2017 meeting provided valuable support for this paper: Cedric Bryant, American Council on Exercise; Charlene Burgeson, Partnership for a Healthier America; Chris Calitz, American Heart Association; Jamie Chriqui, University of Illinois, Chicago; Natalie Colabianchi, University of Michigan; Joanna Frank, Center for Active Design; Dan Goodman, US Department of Transportation; Jessica Grossmeier, Health Enhancement Research Organization; Aaron Hipp, North Carolina State University; Liz Joy, American College of Sports Medicine and Intermountain Healthcare/University of Utah School of Medicine; Peter Katzmarzyk, Pennington Biomedical Research Center; Chanam Lee, Texas A&M University; Sarah Lee, Centers for Disease Control and Prevention; Felipe Lobelo, Emory University; Brett McIff, Utah Department of Health; Kristen Monaco, Bureau of Labor Statistics; Natalie Muth, Rady Children’s Hospital; Heather Patrick, Carrot Sense, Inc.; Kevin Patrick, University of California, San Diego; Margo Pedroso, Safe Routes to School National Partnership; Karin Pfeiffer, Michigan State University; Keshia Pollack Porter, Johns Hopkins University; Nico Pronk, HealthPartners; Jim Pshock, Bravo Wellness; Debbie Rohm-Young, Kaiser Permanente; Brian Saelens, Seattle Children’s Research Institute; Jim Sallis, University of California, San Diego; Charlotte Schoenborn, National Center for Health Statistics; Giselle Sebag, Center for Active Design; Sandy Slater, University of Illinois, Chicago; Kathleen Watson, Centers for Disease Control and Prevention; and Sara Zimmerman, Safe Routes to School National Partnership. The authors would like to acknowledge Harold W. “Bill” Kohl III, University of Texas Health Science Center and University of Texas at Austin, and I-Min Lee, Harvard Medical School, Harvard T. H. Chan School of Public Health, Brigham and Women’s Hospital, for their valuable contributions to this paper. Dr. Buchner reports that his institution, University of Illinois at Urbana-Champaign, received funding from the Center for Disease Control and Prevention’s Division of Nutrition, Physical Activity, and Obesity, and this funding provided partial salary support for him. Dr. Buchner notes that this funding was for work on a separate project and did not support his participation in the convening or manuscript preparation. Dr. Dunton reports personal fees from Dairy Council of California, other fees from National Physical Activity Plan Alliance, personal fees from National Collaborative on Childhood Obesity Research, and grants from the National Institutes of Health, all outside the submitted work. Dr. Sanchez reports that he is employed by the American Heart Association, which publishes guidelines on such matters as physical activity and health surveillance. Questions or comments should be directed to Russell Pate at rpate@mailbox.sc.edu. This work was conducted with the support of Adidas, American College of Sports Medicine, American Heart Association, Centers for Disease Control and Prevention, National Cancer Institute/National Institutes of Health, and National Physical Activity Plan Alliance. The convening and the proposed actions described were developed by meeting participants. The convening entity was the Physical Activity and Health Innovation Collaborative, an ad hoc activity associated with the Roundtable on Obesity Solutions at the National Academies of Sciences, Engineering, and Medicine. The responsibility for the content rests with participants and not with the National Academies. The views expressed in this paper are those of the authors and not necessarily of the authors’ organizations, the National Academy of Medicine (NAM), or the National Academies of Sciences, Engineering, and Medicine (the National Academies). Additionally, the findings and conclusions in this report are those of the authors and do not necessarily represent the official position of the Centers for Disease Control and Prevention. The paper is intended to help inform and stimulate discussion. It is not a report of the NAM or the National Academies. Copyright by the National Academy of Sciences. All rights reserved.